A water connection between the Atlantic and the Mediterranean? Wow! Envisioned by King François I and his friend Leonard da Vinci in the 1500s, the idea of a grand canal that would connect the Mediterranean and the Atlantic was long a goal of French military and political leaders. 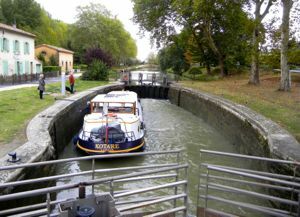 The main part of this canal, the Canal du Midi, was accomplished in the late 1600s under the direction of Pierre Paul Riquet and today provides many opportunities for recreation. It runs southeast from Toulouse through Castelnaudary and Carcassonne to the Bassin de Thau, near the Mediterranean town of Sète. 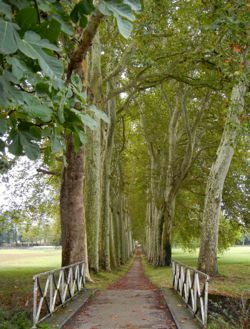 Other elements include the Canal Latéral à la Garonne, which runs from Toulouse northwest, connecting with the Garonne River and going to Bordeaux. Above, Boat in a lock on the Canal du Midi, France. Below, Some of the thousands of plane trees along the Canal.